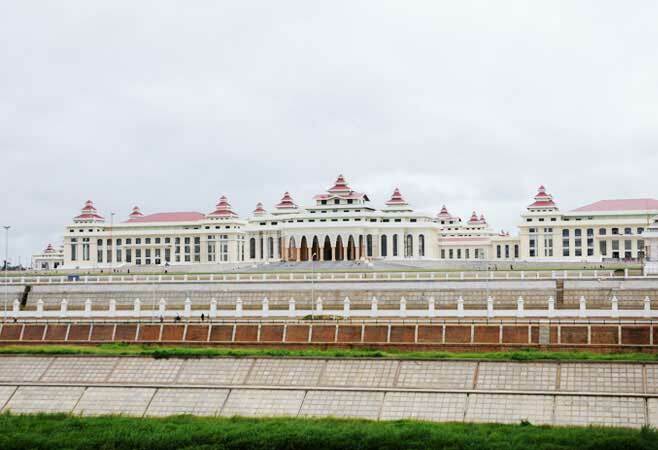 Nay Pyi Taw has a short history, having been founded on a greenfield site in the shrubland some 3 kilometres (1.9 mi) west of Pyinmana, and approximately 320 kilometres (200 mi) north of Yangon, with construction starting in 2002. At least 25 construction companies were hired by the military government to build the city, including Asia World and Htoo Ltd. The military government began moving government ministries from Yangon to Nay Pyi Taw on 6 November 2005 at the astrologically auspicious time of 6:37 a.m. Five days later, on 11 November at 11 a.m., a second convoy of 1,100 military trucks carrying 11 military battalions and 11 government ministries left Yangon. The ministries were expected to be mostly in place by the end of February 2006; however, the hasty move led to a lack of schools and other amenities which separated the government employees from their families for the time being. The government originally prohibited families of government workers from moving to the new capital. Military headquarters were located in a separate compound from the government ministries, and civilians have been banned from entering either. Vendors are restricted to a commercial zone near the government offices. On 27 March 2006, more than 12,000 troops marched in the new capital in its first public event: a massive military parade to mark Armed Forces Day—which is the anniversary of then Burma's 1945 uprising against the Japanese occupation of Burma. Filming was restricted to the concrete parade ground which contains three enormous sculptures—depictions of the Burmese kings Anawrahta, Bayinnaung and Alaungpaya, who are considered the three most important kings in Burma's history. The city was officially named Nay Pyi Taw during these ceremonies. Nay Pyi Taw Myoma Market is currently the commercial centre of Nay Pyi Taw. 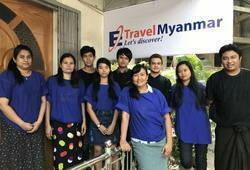 Other shopping areas include Thapye Chaung Market and Junction Centre Nay Pyi Taw. Built by the Shwe Taung Development company and completed in August 2009, Junction Centre is the capital's first privately operated shopping centre. There are also local markets and a restaurant area. Ngalaik Lake Gardens is a small water park situated along the Ngalaik Dam, near Kyweshin Village on Ngalaik Lake (approximately seven miles from Nay Pyi Taw). Opened in 2008, facilities at the Ngalaik Lake Gardens include water slides, natural resorts, lodging and a beach. The gardens are open to the public during Thingyan holidays. 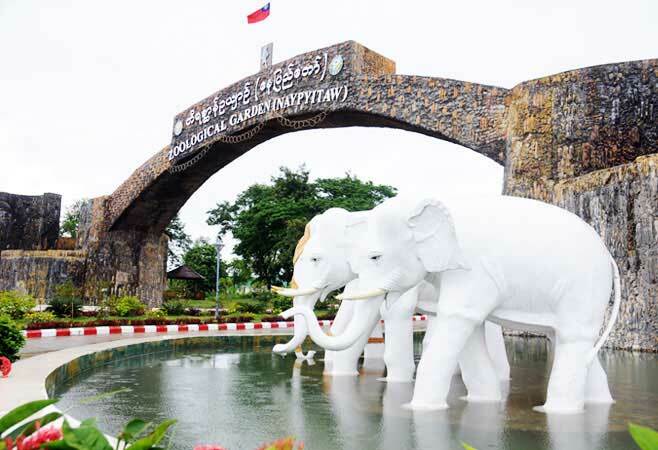 The Nay Pyi Taw Zoological Gardens opened in 2008 with some 420 animals and a climate-controlled penguin house. It is the largest zoo in Burma. 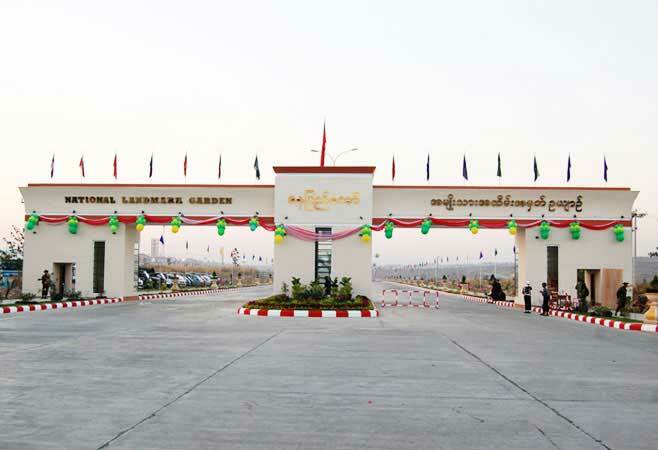 The Nay Pyi Taw Safari Park officially opened on 12 February 2011. Nay Pyi Taw also boasts two golf courses (Nay Pyi Taw City Golf Course and Yaypyar Golf Course) and a gem museum. Public transport services are limited between neighborhoods. The four-lane, 323.2 km (200.8 mi) Yangon-Nay Pyi Taw highway links Nay Pyi Taw with Yangon directly and is part of the 563 km (350 mi)-long overall Yangon-Nay Pyi Taw-Mandalay Expressway. There is a 20-lane boulevard; like most roads in the city, it is largely empty. In August 2011, Russian news media announced that a Russian-based firm would be constructing a 50-kilometre (31 mi) metro line, which would be the country's first underground rail system, underneath Nay Pyi Taw. However, the Rail Transportation Ministry then announced that the plan had been cancelled due to lack of demand and budgetary limits. Nay Pyi Taw has four-lane roads and multilevel, flower-covered roundabouts (traffic circles). Government ministries run shuttle buses in the morning and evening to their respective buildings. The city has a central bus station and one taxi company, which is operated by the military. Motorbikes are banned from some roads in Nay Pyi Taw city limits, including sections of Taw Win Yadana Road, as a result of hundreds of traffic accident-related deaths in 2009. Nay Pyi Taw railway station (published as Nay Pyi Taw railway station) was opened at milepost No. (233/0), between Ywataw station and Kyihtaunggan station on the Yangon-Mandalay railroad with a station area of 2,700 m × 1,200 m (9,000 ft × 4,000 ft) and a covered area of 334.5 hectares (826.5 acres). Construction began on 8 December 2006 and Nay Pyi Taw railway station was opened on 5 July 2009, even though the overpass, locomotive shed, concrete road leading up to the station, parking lot, passenger lounge and platform were not completed. Myanmar Railways has announced that passengers traveling on all trains except mail and local ones are to get off only at Nay Pyi Taw Station as they will not stop at Pyinmana Station after the inauguration of Nay Pyi Taw Station. Before the opening of Nay Pyi Taw railway station, Nay Pyi Taw was served by Pyinmana and Lewe stations, though only Pyinmana station is on the main rail line (which extends from Yangon-Bago-Nay Pyi Taw-Thazi-Mandalay). Lewe station is on the way from Pyinmana to Kyaukpadaung. It takes nine hours by train to get from Yangon to Pyinmana; trains leave at 12:00 and arrive at 21:30 local time. 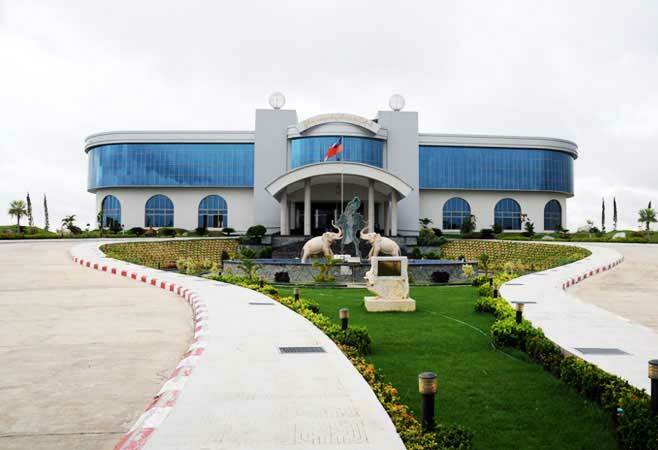 Nay Pyi Taw Airport, also known as Ayelar Airport, is 16 km (10 mi) southeast of the city, between the towns of Ela and Lewe. It is served by all domestic airlines—Air Bagan, Air Mandalay, Myanma Airways, Fmi air and Yangon Airways—with regular flights to Yangon and other cities across the country. Since April 2009, the airport is undergoing major expansion to handle up to 3.5 million passengers per year. Direct international flights includes Bangkok and Kunming. Air Asia started direct flight between Nay Pyi Taw and Kuala Lumpur on 10 November 2014.